Here, in this ebook for the experienced mentalist - is a complete collection of original modern methods and, more importantly - presentations - for this classic routine. 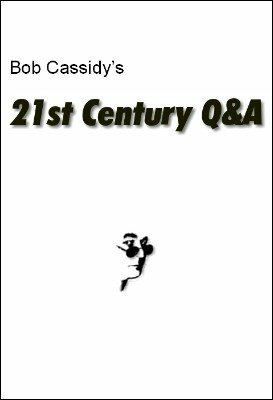 In 21st Century Q&A you will find presentations that suit the modern performing persona and methods that defy detection. And, as in all of Bob's routines, the emphasis is on subtlety rather than electronics, secret assistants, etc. Besides the great historical points and performance instructions, you will also learn what can only be called a true 'Cassidy': How to bend a wire coat hanger into a multipurpose stand. 1st edition 2008; 25 pages.